A recent experiment at Jefferson Lab probed the mirror symmetry of quarks, determining that one of their intrinsic properties is non-zero—as predicted by the Standard Model. From matching wings on butterflies to the repeating six-point pattern of snowflakes, symmetries echo through nature, even down to the smallest building blocks of matter. Since the discovery of quarks, the building blocks of protons and neutrons, physicists have been exploiting those symmetries to study quarks’ intrinsic properties and to uncover what those properties can reveal about the physical laws that govern them. A recent experiment carried out at Jefferson Lab has provided a new determination of an intrinsic property of quarks that’s five times more precise than the previous measurement. The result has also set new limits, in a way complementary to such as the Large Hadron Collider at CERN, for the energies that researchers would need to access physics beyond the Standard Model. The Standard Model is a well-tested theory that, excluding gravity, describes the subatomic particles and their interactions, and physicists believe that peering beyond the Standard Model may help resolve many unanswered questions about the origins and underlying framework of our universe. The result was published in the February 6 edition of Nature. The mirror symmetry of quarks can be probed by gauging their interactions with other particles through fundamental forces. Three of the four forces that mediate the interactions of quarks with other particles—gravity, electromagnetism and the strong force—are mirror-symmetric. However, the weak force—the fourth force—is not. That means that the intrinsic characteristics of quarks that determine how they interact through the weak force (called the weak couplings) are different from, for example, the electric charge for the electromagnetic force, the color charge for the strong force, and the mass for gravity. In Jefferson Lab’s Experimental Hall A, experimenters measured the breaking of the mirror symmetry of quarks through the process of deep-inelastic scattering. A 6.067 billion-electronvolt beam of electrons was sent into deuterium nuclei, the nuclei of an isotope of hydrogen that contain one neutron and one proton each (and thus an equal number of up and down quarks). “When it’s deep-inelastic scattering, the momentum carried by the electron goes inside the nucleon and breaks it apart,” says Xiaochao Zheng, an associate professor of physics at the University of Virginia and a spokesperson for the collaboration that conducted the experiment. To produce the effect of viewing the quarks through a mirror, half of the electrons sent into the deuterium were set to spin along the direction of their travel (like a right-handed screw), and the other half were set to spin in the opposite direction. Researchers identified about 170,000 million electrons that interacted with quarks in the nuclei through both the electromagnetic and the weak forces over a two-month period of running. “This is called an inclusive measurement, but that just means that you only measure the scattered electrons. So, we used both spectrometers, but each detecting electrons independently from the other. The challenging part is to identify the electrons as fast as they come,” Zheng says. Specifically, the present result led to a determination of the effective electron-quark weak coupling combination 2C2u–C2d that is five times more precise than previously determined. This particular coupling describes how much of the mirror-symmetry breaking in the electron-quark interaction originates from quarks’ spin preference in the weak interaction. The new result is the first to show that this combination is non-zero, as predicted by the Standard Model. 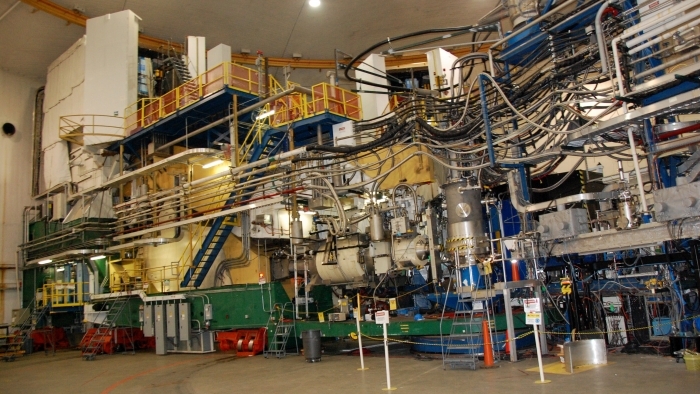 The last experiment to access this coupling combination was E122 at SLAC National Accelerator Laboratory. Data from that experiment were used to establish the newly theorized Standard Model more than 30 years ago. 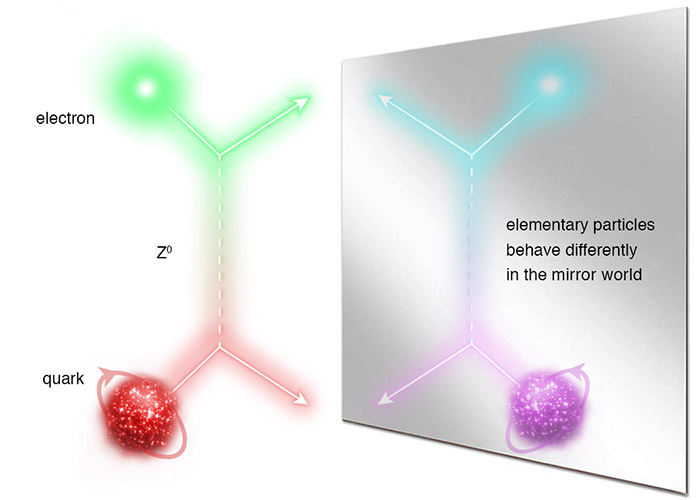 The good agreement between the new 2C2u–C2d result and the Standard Model also indicates that experimenters must reach higher energy limits in order to potentially find new interactions beyond the Standard Model with respect to the violation of mirror symmetry due to the spin of the quarks. The new limits, 5.8 and 4.6 trillion electronvolts, are within reach of the Large Hadron Collider at CERN, but the spin feature provided by this experiment cannot be identified cleanly in collider experiments. In the meantime, the researchers plan to extend this experiment in the next era of research at Jefferson Lab. In a bid to further refine the knowledge of quarks’ mirror-symmetry breaking, experimenters will use Jefferson Lab’s upgraded accelerator to nearly double the energy of the electron beam, reducing their experimental errors and improving the precision of the measurement by five to 10 times the current value. The experiment will be scheduled following completion of the upgrade in 2017.